Heat pump condensers and air handlers, controls, supplies, replacement and OEM parts, air filters, related-software and thermostats. 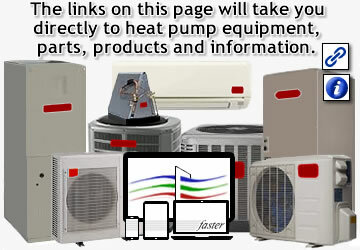 Heat pump outdoor and indoor units, computer software, parts, thermostats, air filters and installation supplies. The new technology for heat pump efficiency is variable speed motors and inverters. Heat pumps can be used with an oil or gas-fired furnace. Outdoor optimizers can be set to certain regional temperatures to stage between the heat pump and furnace as temperatures rise and fall. btu/h:One British Thermal Unit per Hour is the heat that will raise the temperature of 1 pound of water by 1 degree Fahrenheit. 12,000 BTU/H equals 1 ton of heating or cooling capacity per hour. For example, a 3 ton heat pump is equal to 36,000 BTU/H. electrostatic air filter:A washable air filter that becomes statically charged as air passes through it. The positively charged woven material attracts and traps particles as they pass through the filter. Some electrostatic air filters can be built in custom sizes. defrost control board:A solid state control located in a heat pump condenser (outdoor unit) used to switch the system into a defrosting mode. Activated by a temperature sensor and/or timer, the control will allow refrigerant to cycle through the outdoor coil removing any build-up of frozen moisture which had accumulated during the heating process. capacitance:A measurement term used to determine how much of an electrical charge a capacitor can store. indoor refrigerant coil:The coil inside an air conditioning or heat pump's air handler or attached to the furnace. Its main function is to absorb cooled (heat mode) or heated (cooling mode) air. reversing valve:A heat pump component that changes the direction of refrigerant flow. By reversing the flow, the refrigerant cycle is changed from cooling to heating. low voltage wiring:Commonly referred to as 'thermostat wire', comes in different gauges and a number of multi-colored wires. For example, a 22/8 wire would contain 8 different colored, 22 gauge wires. seer:Seasonal Energy Efficiency Ratio. The higher the SEER number, the greater the energy efficiency of the unit. There are too many justifications why any one household would want to purchase a lower SEER rated system compared to a higher SEER rated system or vise versa. To be direct, it is a personal decision based on two basic concepts: Lower SEER = Pay less now for the system and more on future energy bills or Higher SEER = Pay more for the system now and less on future energy bills. Talk with your estimator about price differentials and savings between ratings to determine what is best for your household. r410a refrigerant:A mixture of difluoromethane and pentafluoroethane which is used as a refrigerant in air conditioners and heat pumps as a replacement for ozone-depleting refrigerants like R-22. R-410a is not a drop-in refrigerant and can only be used in 410a equipment. heat pump thermostat:A thermostat designed for heat pumps only. A common mistake among DIYers is buying a single stage thermostat for a furnace or boiler. Warning: Though there is an HVAC universal color code for low voltage wiring, not all heat pump systems are wired the same. Ductless systems are starting to become popular in the U.S., so are heat pump water heaters. This directory contains an index that will guide you to a specific heat pump item or topic online. This web page focuses on residential, split-unit, heat pump systems. Heat pumps are getting more and more efficient each year. Remember, when you change an outdoor unit (condenser), the indoor coil (evaporator) has to be compatible for the system to run efficiently.